J.M. Barrie’s Peter Pan is a classic children’s story for a very good reason – it offers children a chance to visit a land beyond their wildest imaginations, meet the colourful characters that inhabit it and, most importantly, teach them a soothing message about the importance of growing up but retaining a sense of child-like joy whenever it’s called for. Absolutely none of that is found in Joe Wright’s Pan, which is bound to insult everyone who adores the original story, and also everyone who’s watching in general. The film serves as an origin story – and there’s your first big problem right there. If anyone needs an origin tale, it certainly isn’t Peter Pan; the mysteriousness of the character is what entices us to begin with, so by filling in the blanks the charm evaporates and we’re left with yet another Harry Potter archetype which was outdated even by the time Harry Potter came around. But we’re getting off track – young Peter (newcomer Levi Miller) is a young orphan boy living in World War 2 London (sorry to go off on another tangent, and correct us if we’re wrong; but Barrie’s original play debuted in 1904, nearly forty years before the war even breaks out – so we’re to assume that Peter Pan can also time-travel as well as fly? Because that’s… just… oh, let’s move on). One night, he’s whisked away to Neverland in a flying pirate ship (okay, getting a little back on track), as part of a deal by Kathy Burke’s ugly Irish nun (wait, what?!) where he comes across a ruthless dictator in the form of Hugh Jackman’s overacting Blackbeard (wha… sure, whatever), who tells young Peter of an ancient fairy prophecy (oh God, not this again) about – what else – a boy that can fly. Well, gee, whodyathink’s gonna fill those shoes? From there, it’s absolute madness, and we’re not just talking about the events in the movie; young Peter teams up with a gurning Garrett Hedlund as James Hook, they encounter some of the most cartoonish creatures ever conceived for an effects-heavy family film, and they run into a Native tribe where pretty much everyone is white or not Native, and explode into powder paint when injured, which technically makes this surprisingly one on the goriest movies of the year. And they have materials to make trampolines, in an environment where that sort of fabric and elastic is impossible to even find; same with wires and transportation trolleys, as well as an entire construction site for mining fairy dust, WHERE THE HELL DO THEY FIND THIS STUFF?!?! Oh, and did we mention that upon arrival to Neverland, everyone – and we mean EVERYONE – starts to sing, right out of nowhere, NIRVANA’S SMELLS LIKE TEEN SPIRIT. In a film that takes place in the 1940s. In friggin’ NEVERLAND, the world of innocent imagination. AND NOBODY EVER DOES ANYTHING LIKE THAT, OR EVEN MENTIONS IT, AGAIN. We wish to God we were making this all up. So, as you can tell, we didn’t like this movie very much. Never mind the fact that almost everything about it takes a massive dump on the original beloved classic, but on its own it’s extremely soulless. Joe Wright has been known to be a fascinating visual director, with Atonement and Anna Karenina being the most prolific examples, but here, not only are the visuals drenched in a CGI overload that makes everything look far too cartoony and fake, and it’s really bad CGI just to add insult to injury – one particularly awful shot of Peter floating about in space makes him look like he’s leftover footage from The Polar Express, it’s that bad – but it’s not even a pleasant movie to look at. Everything’s just so grey and lifeless; even the shots that are meant to inspire wonder and enchantment have a creepily desolate feel to them, and the 3D, while effective at times, doesn’t especially help in its murkier shots. One gets the impression that Wright simply re-watched Tim Burton’s now legendary Alice in Wonderland failure over and over to get the idea of what the studio wanted, with no artistic license of his own to add. Speaking of that particular movie, as bad as it is as an overall adaptation of Lewis Carroll’s book, we guarantee that Pan is much worse. In that film, at least there were some interesting visuals and some inspired designs in its costumes and sets, as is typical with Burton; Pan doesn’t even have that, as everything looks absolutely ugly and unpleasant, making it much more of a painful sit. We shan’t go into too many details in case of spoilers, but let us assure you that if you seek an alternative version of the Peter Pan story, seek out Steven Spielberg’s Hook instead – not a perfect film by any means, but at least it’s a more interesting and creative set-up and payoff than anything in Pan. Or just watch any other version of the original story, whether it’s the Disney version or the underrated 2003 one with Jason Isaacs – anything as long as it’s not this disgrace to Barrie’s greatest creation. 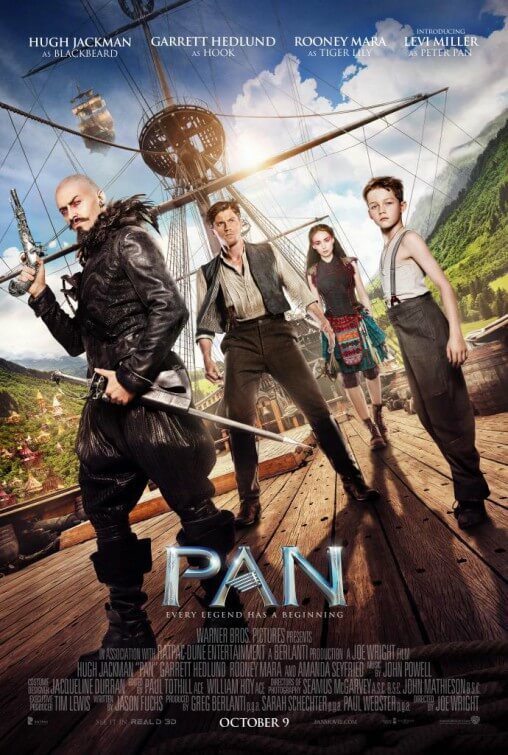 By taking everything that made the original story a classic and dumping all over it with an infuriating and clichéd script, as well as ugly and soulless visuals, Pan is one of the worst adaptations of classic children’s literature since Tim Burton’s Alice in Wonderland, and one of the most insulting films to ever be made about The Boy Who Never Grew Up.